Today we are going to talk about several interesting topics but first we will start on a said note about Christian Vigh the PHP innovation award winner of the year 2016 that according to his brother he has died and we are very sad because he was a great contributor. We will talk more about this right after the beginning. 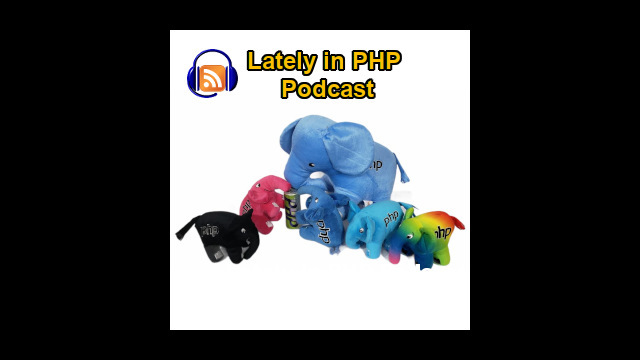 Next we'll start talking about the usual developments of the latest PHP versions not just PHP 7.0 and 7.1 but also PHP 7.2 alpha that started to have its new releases. Then we start talking about the usual proposals and RFCs starting one to have the retry functionality for exceptions on which you will be allowed to specify that one exception can happen multiple times and if it happens once it can be retried up to a limit, meaning that the code that is inside that section will be run again. Next we'll talk about a proposal to use Doxygen to document the C sources of PHP I mean the PHP engine. Next we'll have a proposal to be able to specify an offset on a string that needs to be matched with regular expressions with preg_match and other functions of the preg extension. Next we talk about a new value for the PHP_OS_family when you are using the Mac OS and similar OS engines, I mean versions from Apple. Next we will talk about a proposal for supporting the unary coalescing operator for instance checking if certain request variable is set if it is not set the value is evaluated as null, just to avoid warnings of undefined variables. Next we will have a proposal for inclusion PCS in PHP 7.2 which would be the ability to make PHP code and C code to develop PHP extensions. This is interesting, we'll talk more on that. Next we'll talk about the possibility to have final variables like you have in Java, not just for scalar types of variables which you can do already using constants but also for objects like objects that do not change despite the information inside the objects may change. Next there will be a revival of the proposal to use msg_pack as a binary format for serializing and unserializing data currently using serialize and unserialize functions but this would be to generate a more efficient format which would be msg_pack. Next we'll talk about some articles that were published on PHP Classes blog starting one about the 18 years a PHP classes just reviewing what happened in the last year in terms of new developments and also about upcoming plans that would happen around PHP Classes. Next we'll talk about several articles, one that is about the best PHP books of 2017 2016. This is just a ranking of books that is generated dynamically, so this article will be updated regularly. It's not static article. Next year is about the best PHP books of 2018 and 2017. And then we'll talk about a couple articles that are tutorials. One for importing Excel spreadsheets into MySQL with a class that exists on the site. Another is to manipulate matrices in PHP.